four legged foodies: Savour 2012, Come Celebrate the Delicious! We were lucky to reach just about when the gates open and without a massive queue. As soon as you step in the festival ground, there is a booth for purchasing extra Savour dollars or Sav$ (for the daytime entry, you get Sav$21 per ticket) - and so we did! Figured it would be wise to budget our spending right upfront lol. We bought another extra Sav$48 for both of us. First stop - one of the few restaurants in the world which is a 3-Michelin star vegetarian restaurant. World renowned L'Arpege, home to world renowned Chef Alain Passard! 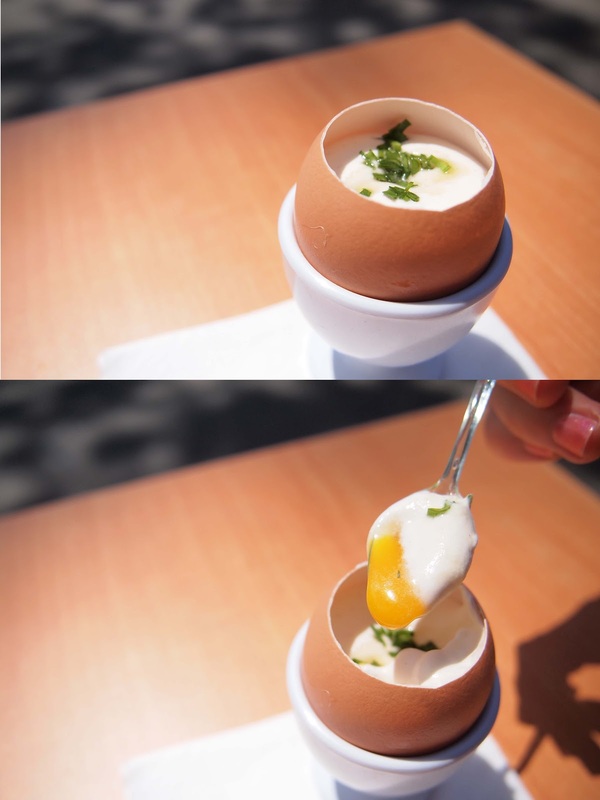 We were particularly keen to try out the chaud froid of egg, made famous by Chef Alain Passard. Definitely the most I have ever (and probably, will ever) pay for an egg - Sav$18 for a single egg! Texture was definitely interesting with the foamy light creamy mixture on the top (we later found out no egg whites were used), with vinegar providing a depth of taste. The maple syrup was not immediately identified. Flavours were unfamiliar until the soft runny yolks. I thought this was a remarkable and creative dish - I'll never look at an egg the same way again! Felt like some molecular chemistry was at work but in truth there was none - cold, creamy, foamy, mildly sweet and vinegary, many-a-WTFs were given while we enjoyed the roughly 6 spoonfuls worth of chaud froid. While I wasn't blown skyhigh in amazement, I was definitely impressed with the ingenuity and sheer curiousness of flavour! We then trotted to sample some 2-Michelin star dishes now, from Chef Alvin Leung of Bo Innovation. Molecular Xiao Long Bao caught our attention - and I knew we had to try the waffles (can't say no to waffles, especially if it comes with black truffle). Waffles were being prepared upon order right at the booth counter. Free heavenly waffley smells for all! This did not disappoint. Generous sprinkling of black truffle and a big scoop of fragrant vanilla ice cream on top of a crisp waffle. A much needed cold salvation in the blistering heat, generous sprinkling of black truffle with ice cream on waffles is sheer decadence! Crispy outside and fluffy, moist inside. Yumm. Having had our dessert first lol we now braced ourselves for the peculiar spheres atop funky plastic spoons... and wow, this was truly amazing! The balls burst in your mouth, releasing XLB essence. We would have gotten more if it was not Sav$6 a pop. Wow ... not often do I receive such epiphany within 2 seconds of introducing food to my mouth. Quite literally, xiao long bao soup encased in a taut gelatin skin with a single strand of pickled ginger, the tiniest prick with your teeth causes a literal soup explosion. In your mouth. And it does really taste like XLB, have to say this is easily the most interesting dish of the day. Masterclasses (hardly an actual masterclass) available at no extra charge - just turn up and take a seat! Chef Frank Bruwier of Le Cordon Bleu, France ran us through some basic basic techniques and flavours used in vegetable stews. One more stop before we headed upstairs to the gourmet market area, we decided to try some Mexican from Pujol. Mexican pig! As we required some form of meat. Slight crunch on the skin, decadent fat and juicy meat - and the entire pork belly was soooo soft, no problems were had slicing with a plastic knife. The spice was quite light and a tad sour, and together with what seems like alfalfa and the pickles - really great! Soft soft soft fatty pork. As we escaped the scorching demonic broil into the pit building for the gourmet market and other classes, you get a nice overview of the Savour gourmet village. We attended a short lesson on sous-vide cooking by Chef Mark Richards of Keystone Restaurants. Free samples FTW! A small taste of medium-rare sous-vide steak with sprinkled salt - I do want to try Keystone now. Attended another hour of cooking class - this time by Russian Chef Sasha Kutuzova of Buyan Russian Haute Cuisine. Was an interesting spectacle into Russian food and culture (want to try Buyan now too!). We finally adjourned to check out the air-conditioned gourmet market. Lots of delis, coffee booths, bakeries - all kinds of stuff la! One of my favourite places of Savour - we could have stayed here all day and tried all the huge chunks of CHEESE samples. As the event drew to a close, we needed to finish our remaining Sav$ so we went down. This time to Boa Bistro. 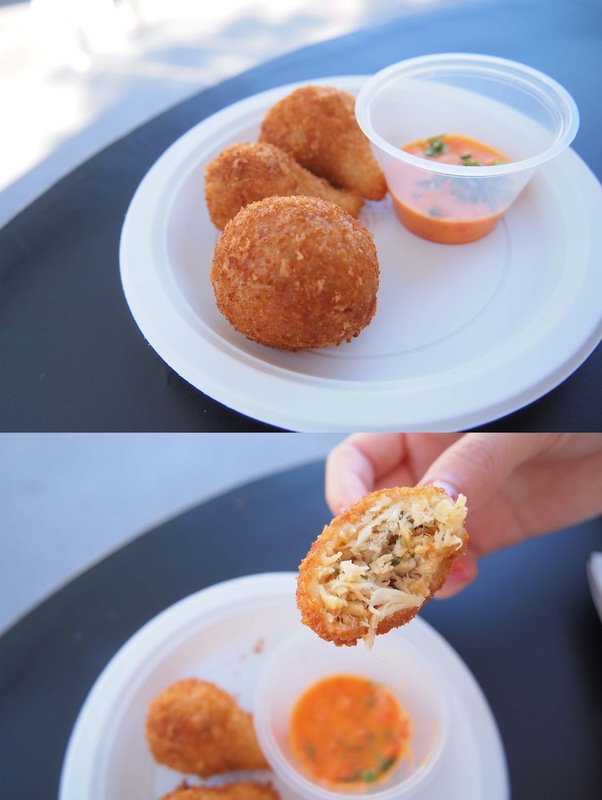 We rationed our remaining Sav$ and opted to try their Coxinha which were chicken croquettes. Light crumb exterior with a shredded chicken interior - I liked how it was shaped like a drumstick (hence, Coxinha) for ease of eatage. Tastewise was just alright, no real interesting taste of spices except being well done. Sauce was supposedly pepper jelly but tasted more like a mild cheese dip. With our last remaining moolah we opted for a dessert to end the day on a sweet note at one the top restaurants in Singapore, Jaan (which upon checking, has ridongculous ala carte prices). Well as the name suggested, we got chocolate with nuts. Choconuts. Have to say the plastic plate didn't help its otherwise intricate presentation, but taste wise was just alright. The stack with chocolate, peanut butter and sable was not bad, but lukewarm partially due to the heat. Besides that wasn't too impressed, but the full portion with proper plating, airconditioned with proper ambience might do justice to it. All things considered, we really enjoyed our day out at Savour. It's a great idea bringing in top restaurants to showcase their signature dishes - we would otherwise not have the opportunity to see taste and "celebrate the delicious".